Post Name : Direct recruitment of Stipendiary Trainee/TM and Stipendiary Trainee/SA. KKNPP invites application to fill its vacancies for the post of Stipendiary Trainee /Technician-“B” (Group-C) and Stipendiary Trainee / Scientific Assistant/B (Group –B) to share these challenging spectrum of responsibilities. Kudankulam Nuclear Power Project (KKNPP) is one of the Unit under Nuclear Power Corporation of India Limited. 1. Stipendiary Trainee/Technician – ‘B’ – 117 Nos. 2. Stipendiary Trainee/Scientific Assistant – ‘B’ – 62 Nos. 1. a) Plant Operator 42 i)HSC (10+2) or ISC (with Science subjects) with not less than 50% marks in Science and Mathematics individually. ii) Shall have English as one of the Subjects at least at SSC level Examination. Pass in HSC (12th Std.) with not less than 40% marks in Science and Mathematics individually with English as one of the subjects at least at SSC level examination. 2. b) Electrician 20 i) SSC (10 years) with minimum 50% marks in Science subjects and Mathematics individually and 2 years ITI Certificate Course in Electrician/Electronic Mechanic/ Instrument Mechanic/ Fitter/ Turner/ Machinist/ Welder/ Draughtsman (Mechanical) /Plumber Trade. ii) Shall have English as one of the subjects at least at SSC level Examination. i) Pass in SSC with Science and Mathematics and 2 years ITI Certificate Course in Electrician/Electronic Mechanic/ Instrument Mechanic/ Fitter/ Turner/ Machinist/ Welder/ Draughtsman (Mechanical)/Plumber Trade. ii) For trades for which the ITI Course is less than two years, 1 year experience in the relevant area after completion of the course. iii) Shall have English as one of the subjects at least at SSC level Examination. The definition of disability is as per O.M.No.36035/3/2004-Estt(Res) dated 29.12.2005. Age Should be between 18 to 24 years as on 21.05.2018. 2. 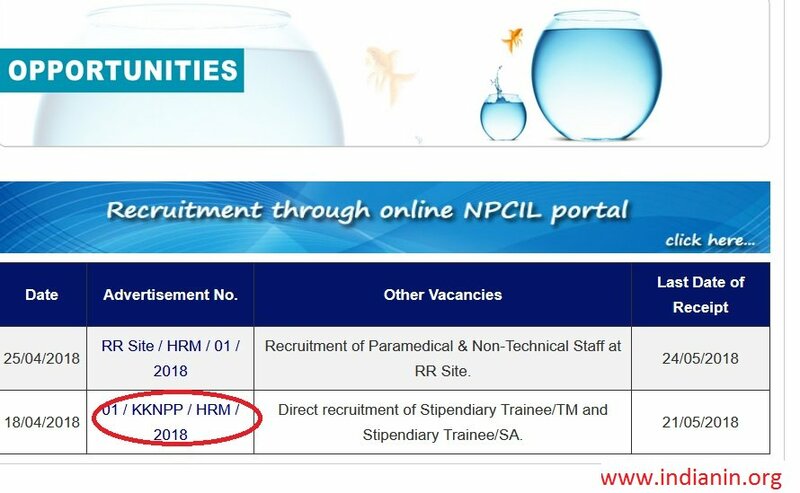 Serving NPCIL Employees applying against this open advertisement for direct recruitment shall be considered without any age restriction, subject to fulfillment of other eligibility criteria. Note : There will be No relaxation in the Educational Qualification and percentage of marks and they shall be as per the eligibility requirement for their post. Duration of Training 2 years (No reduction or increase in the period of training is permissible). Stipend during Training Rs. 10500/-p.m. (consolidated) for 1st year. Physical Standards Minimum height 160 cms. Minimum weight 45.5 kgs (100 lbs). The above physical standards are relaxable by the Head of the Unit in highly deserving cases. Grade, Level, Entry Pay and other allowances after successful completion of training: On the basis of the performance during the Training the successful Trainees are likely to be considered for appointment to the post of Technician “B” in the Level 3 of 7th CPC Pay as per CCS (RP) Rules with entry pay Rs.21,700/- (plus other allowances like Central Dearness Allowance, Children Education Assistance, Canteen subsidy, Site Allowance, Cable TV reimbursement, News Paper reimbursement, Medical Assistance, Transport Facility/ Allowance, Washing Allowance, Family Accommodation, School facility etc. as admissible from time to time as per Corporation Rules). Stage-1 Preliminary Test : The selection process will consist of test in 3 stages. ** It will be a Screening examination to be held to shortlist candidates. 1. Examination will comprise 50 Multiple Choice Questions of 01 hour duration consisting of Mathematics, Science and General Awareness. 2. Three marks will be awarded for each correct answer & one mark will be deducted for each incorrect answer. Accordingly, the General Candidates with <40% marks and the candidates belonging to SC/ST/OBC with <30% marks will be screened out for Stage-2. Accordingly, the General Candidates with <30% marks and the candidates belonging to SC/ST/OBC with <20% marks will be screened out for Stage-3. 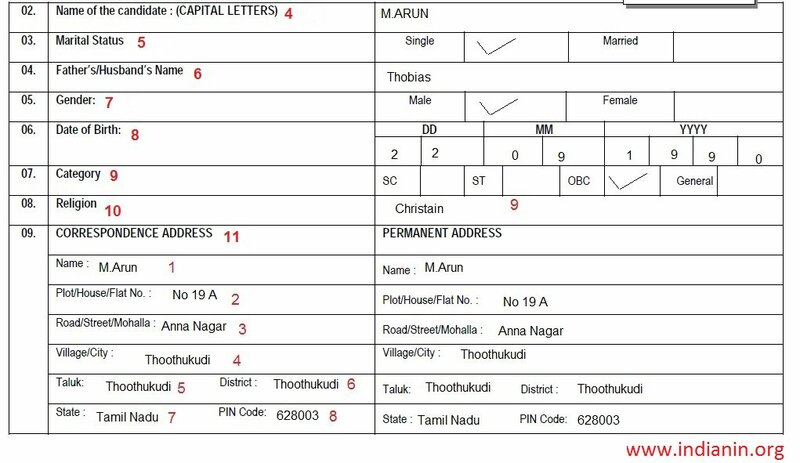 Verification of Certificates : The credentials of the candidate shortlisted in Stage-2 will be verified with the original certificates his/her all Educational qualification certificates, SC/ST/OBC/PWD certificates, Age and other original certificates before being allowed to Trade/Skill Test. All the candidates shortlisted after Stage-2will be allowed to Trade/ Skill Test only after certificate verification of candidates. The candidates without original and Photo copies of certificates strictly will not be allowed to Stage-3. For candidates whom Trade/Skill Test is not applicable and not having original and Photo copy of certificate will be rejected strictly. Diploma with not less than 60% marks in Mechanical Engineering a) The Diploma in Engineering should be of three years duration after SSC/HSC. b) Should have had English as one of the subjects either at SSC or at HSC level examination. Note: Diploma through Lateral Entry to 2nd Year Diploma after X (SSLC) + ITI will NOT be considered. Mathematics at H.Sc. (10+2) level is essential. Candidate having Mathematics as the principal subject at B.Sc. are not eligible. Shall have English as one of the subjects either at SSC or HSC level examination. 02 B.Sc. with a minimum of 60% marks. B.Sc. shall be with Chemistry as Principal and Physics/ Mathematics/Statistics/Electronics & Computer Science as subsidiary OR with Physics, Chemistry and Mathematics as subjects with equal weightage. Should be between 18 to 25 years as on 21.05.2018. 2. Additional age relaxation in prescribed age limit commensurate with experience of working with NPCIL on Contract/ Fixed Term Basis, subject to a maximum of 5 years will be given. 18 months (No reduction or increase in the period of training is permissible). Rs. 16000/-p.m. (consolidated) for 1st year. Rs. 18000/-p.m. (consolidated) for 2nd year. ** plus other allowances like Central Dearness Allowance, Children Education Assistance, Canteen subsidy, Site Allowance, Cable TV reimbursement, News Paper reimbursement, Medical Assistance, Transport facility/ Allowance, Washing Allowance, Family Accommodation, School facility etc. as admissible from time to time as per Corporation Rules). ** Written Test will comprise of 200 Multiple Choice Questions (Choice of four answers) of 3 (three) hours duration consisting of English, General Knowledge, Quantitative Aptitude and respective Discipline. General Category (UR) : 40% marks. ** The final selection of the candidates will be done on the basis of performance in the written examination and interview. ** The number of candidates shortlisted for interview will be depending upon the number of candidates qualifying in the written test and number of vacancies. ** The credentials of the candidate will be verified with the original certificates his/her all Educational qualification certificates, SC/ST/OBC/PWD certificates, Age and other original certificates before being allowed to Interview. 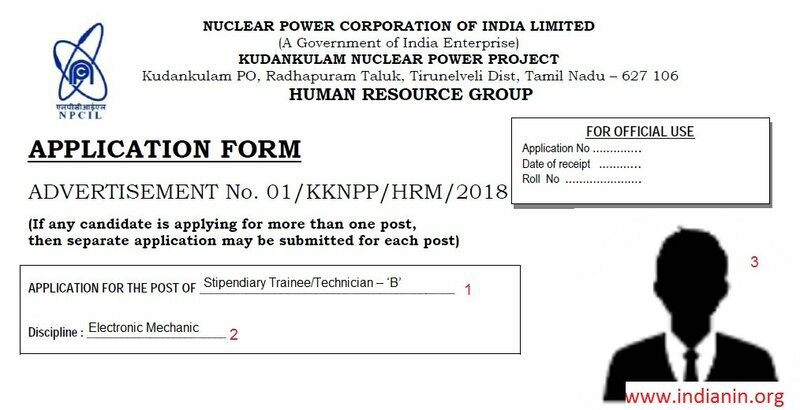 ** The selected candidates will be required to execute a Service Bond for a period of 5 years in the prescribed form to complete the Training and to serve the Kudankulam Nuclear Power Project and or any other constituent Units of Nuclear Power Corporation of India Ltd.
** During and after training, they will be required to attend round the clock shifts. ** Indemnity Bond for the value of Stipend & Book Allowances payable. ** Candidates selected against this advertisement will be posted at Kudankulam Nuclear Power Project, Kudankulam to fill its vacancies. ** However, they are liable to serve in any part of India and transfer from one unit to another, as may be required in Corporation interest. Visit the official website, click on “HR Management” Category in Main menu,then click on “Opportunity” option in the droop down list. Step 3 : Upload Your Passport size Photo. Please note that no change in the email id and mobile no. will be allowed. ** The application should be submitted in the proforma attached to this advertisement. ** The application form along with copies of certificates should not be folded and posted in an A4 size envelope (size 35cm X 26cm). ** The outer cover should be super scripted ‘APPLICATION FOR THE POST OF “_______________________” indicating the post/category/discipline. as the case may be, against Advertisement No._____________________________. Photograph : Recent passport size photograph should be affixed on application form. Candidates should submit self attested photo copies of the following certificates along with their application. c) Certificate – Educational Qualification and Technical Qualification. Mark sheets of all the semester/year to be submitted. i) Employment Preference Certificate for Project Affected Persons – if applicable for those who are applying for the post Stipendiary Trainee -Technician/B. 1. Experience Certificate duly issued by the NPCIL Contractor. 2. ID Proof of which company he is working/worked. 3. Copy of Bank Pass Book or Wage slip supporting the experience. by Post/Courier only so as to reach us on or before 21.05.2018.